Enjoy this upgraded 2 Bdrm 2 Bath plus den(approx 1400sq ft) that has a trundle bed(has 2 twin beds), On the first floor. Has granite countertops and stainless steel appliances. Walk out the lanai and into the salt water pool. This complex is fully equipped with fitness room, multiple pools. tennis courts, shuffle board, pickle ball and bocce courts. Has a beautiful community room with a Billiards room. 5 minutes to Barefoot/Bonita Beach and has a beautiful pay as you play golf course. Close to shopping and restaurants. We are located right on Bonita Fairways Golf course. All linens provided but must be Clean and put back up before you depart. One covered parking and plenty of guest parking available. Towels are provided. Must be clean and folded and put back before you depart. On property. Large workout facility. With many machines. On property available to all tenants. Multiple regular water and salt water bottles available on property one pool right behind Lenai of my unit. 10 feet walking distance. I am a seasoned world traveler. I have stayed in many places and in many countries; however, this is the first property I have stayed in that looks EXACTLY like the pictures. 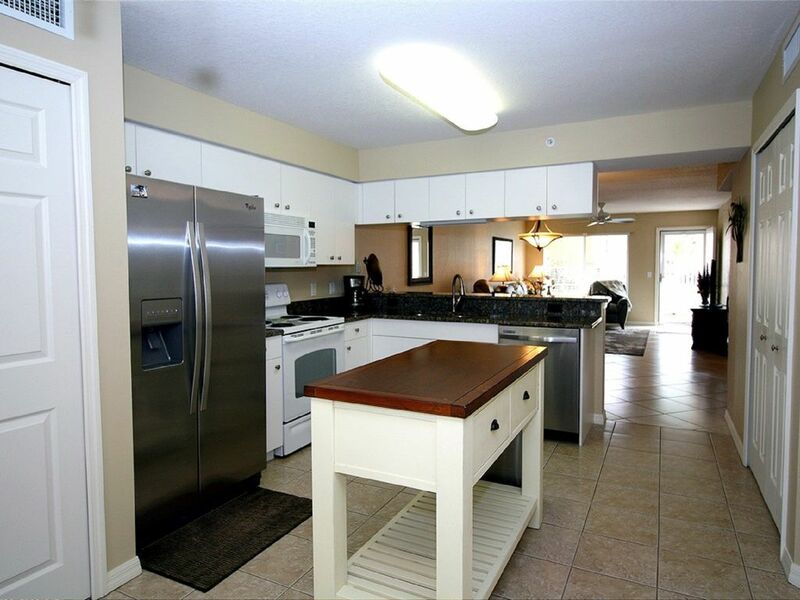 This property is spacious, roomy, and centrally located between Naples and Fort Myers. There is enough space to sleep 6 easily. The kitchen is large and can accommodate entertaining. It came fully stocked with dishes, pots, pans, cutlery and cooking utensils. The only thing I had to do was buy food. Cleaning supplies, linens and towels are also supplied. There is a full sized washer and dryer are adjacent to the kitchen. The bathrooms are nice, one is ADA friendly. The property is right next to the swimming pool area. Since this property is between two larger cities, I had the option of going to either city for cultural activities. This property is five minutes from four major grocery stores, restaurants, fitness clubs, hair and nail salons, gas stations and is eight minutes from Bonita Beach. The area is quiet and virtually crime free. The neighbors are friendly, but not intrusive. I was able to contact the owner by email or phone call. I had no problems working with the property management company also. When I return to this area, I will definitely return to this property if it is available. Rates are subject to change until under deposit. No smoking/pets in condo. Cleaning fee of $100.00 required. If you have any questions or concerns please contact owner directly 802.558.4459(Jackie) Also, there is a separate $500.00 security(refundable) deposit due directly to the association over and above the $1000.00 deposit being made to VRBO. This deposit($500.00) needs to be sent in with the $100.00 application fee to the HOA.